Reach new heights with the newest innovation from Park Structures: The Apex. Developed for use by children ages 2 to 5 and 5 to 12, the Apex Climbing Attachment provides full body support that developing young children need, as well as a completely new challenge for older children when configured as a lateral climber. The Apex provides endless climbing possibilities that simulate real rock climbing by encouraging children to use their creativity in finding routes either laterally from deck to deck or up and over. The path is different every time, making Apex the height of climbing for today's youth. The next generation of the Infinity from Little Tikes Commercial has arrived. Three Infinity play components come together to form one of the most innovative play events around: the Infinity wave, the Infinity climber and the Infinity pads. Users can reach the web's pinnacle by snaking through the vertically stacked Infinity pads or scale the challenging internal climbing net that connects all points of play. 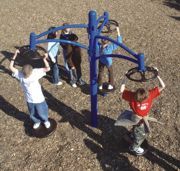 Childforms® is a total solution for your playground needs. You can choose from a full line of cost-effective products to enhance any playground. The Child TurfTM recycled rubber safety surfacing and the FuntimbersTM provide an effective solution for your surfacing needs. Is ADA accessibility a concern? If so, by using the FuntimbersTM and ADA ramp system, as well as ADA accessible surfacing, you can provide convenient, ADA accessibility to your playground areas. Explore the endless options available with RCI's exciting line of early childhood components and structures created especially for the pure imagination of preschool children. Design your own or choose from inspired structures with titles like Color Crawl and Play Palace, bursting with colorful 3/4-inch-thick compression-molded poly panels that are guaranteed for a lifetime. Create fun zones filled with climbers, slides and panels. There is a Trike Track, a Tot House with flower boxes and shutters, plus creations for water, sand and gardening play. Wild Things includes jungle cats, elephants and more. Check out this imagination bonanza for your playground. Looking for a playground surfacing option that's safe, clean, economical and environmentally friendly? Miracle's Play TerrainTM Rubber Crumb is a smart, colorful, nontoxic alternative to traditional surfaces. It won't splinter, attract insects or stain, and it's softer than sand, but tough enough to withstand the whims of Mother Nature's elements. Available in six vibrant colors, Play TerrainTM will enhance the appearance of your playground while meeting all ADA and ASTM safety standards. It's one of the hippest surfacing options around. The new Orbiter spinner from Landscape Structures is a two-piece play event that can provide self-propelled fun for several kids at one time. Each spinning base is paired with an overhead wheel that is set at an opposite, 10-degree angle to create an ultimate spinning challenge. The Orbiter spinner helps kids discover the cause and effect relationship of body position and movement and also improves their balance and coordination. It's available as an independent event or as a PlayBooster component. The Dynamo ApolloTM series is the merry-go-round for the new millennium. The ApolloTM brings movement, balance, exercise and fun back to the playground. It features Dynamo DX technology, which includes an innovative bearing system that maintains a safe rotational speed so children can safely enjoy the same exhilarating experience as we did on the merry-go-rounds of yesteryear. SPI Industries Inc offers a new dynamic climber to add to your playground: the Dino-MiteTM Climber. This new dinosaur climber is great for any playground. It can be used for 5-foot and 6-foot deck installations with no secondary components required. It offers a variety of step profiles for climbing, and both sides are different, allowing for added interest and face-to-face installations. Featuring great textures, molded-in handrails and multiple climbing methods, it challenges children of all ages. 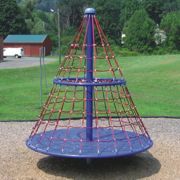 With an easy one-piece installation, this appealing structure will enhance your playground.